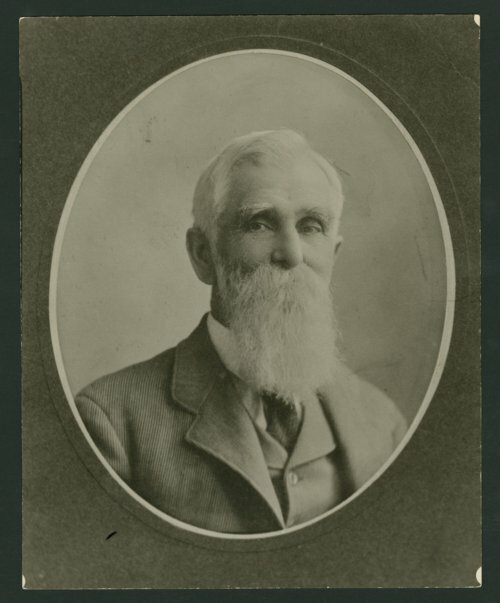 This photograph shows Watson Stewart, (1827-1910). Stewart a native of Miami County, Ohio migrated with his brother Samuel in 1856 to the Kansas Territory. The brothers were members of the Kansas Vegetarian Emigration Company that settled in Allen County, Kansas near the town of Humboldt. Watson quickly became a prominent member of the community when he was appointed in 1858 to Justice of the Peace for Allen County. The following year he accepted the nomination to serve in the senate of the territorial legislature. The start of the Civil War put a temporary hold on his political career. Stewart was commissioned as a major into the Allen County Battalion of Company A. This local militia of men protected the military posts in and around Humboldt and Ft. Scott, Kansas. After the war Stewart was elected in 1865 to the Kansas House of Representatives as a Republican from the Fifty-Fourth District. He served only one term before President Lincoln appointed Stewart as Register of the U.S. Land Office in Humboldt. A position he was re-appointed to by President Grant in 1869. When the land office moved to Independence, Kansas at the end of 1871, Stewart chose to remain in Humboldt bringing his career as a civil servant to a close. He returned to private life to resume his interest in real estate. Earlier Stewart had owned and operated a real estate business in the Humboldt area. In April of 1877, he moved to Independence, Kansas and opened a new real estate, and insurance office. Stewart owned the business for a number of years before selling it in 1894. In his remaining years Stewart and his wife Elizabeth traveled across Kansas and other parts of the country. On August 3, 1910, Watson Stewart's long and successful life came to an end when he passed away at the age of eight-three in Colorado Springs, Colorado.